The issue with Sinclair running over 200 TV news stations, Oliver pointed out, was just how right-leaning the company is ideologically. That wouldn’t necessarily be a problem, except that Sinclair requires its member stations to air segments and full-length documentaries that hew politically conservative. With widespread news broadcaster consolidation sweeping the country, and little transparency at the local level about who owns what and which statements are your local newscasters and which are from corporate headquarters, the worry, says Oliver, is that Americans will be increasingly force-fed opinion from local news sources that are, in many places, much more trusted than national media. Aside from forerunners Nexstar and Sinclair – which own over 100 TV stations each – the largest players are Gray Television, Ion Television and Raycom Television, which own over 50 stations each. 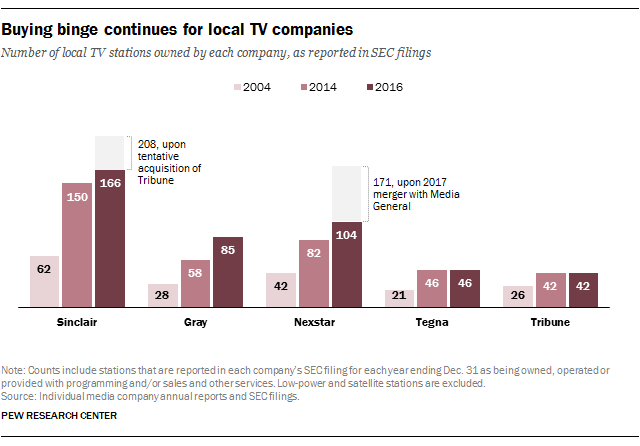 Other major players – owning over 20 news stations each – include Tegna, Univision Communications, Hearst Television, and Trinity Broadcasting Group. These top 9 companies own over 800 full-power TV stations across the country. That’s almost 50 percent of America’s local TV news. That consolidation means your local newscaster may not have had an actual hand in the story she’s reciting. 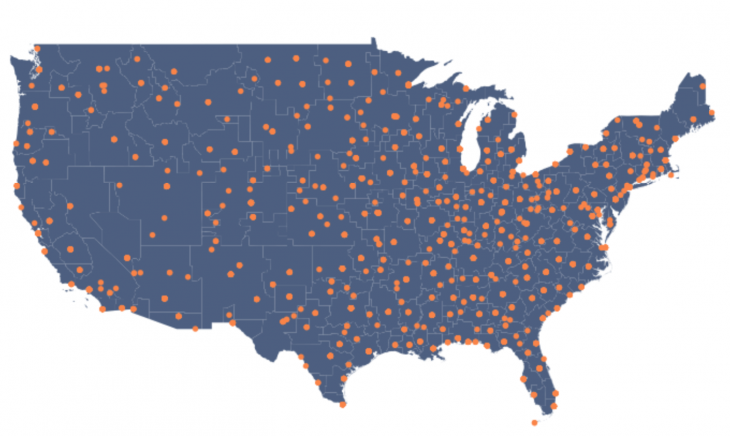 According to a recent RTDNA survey, 705 stations – roughly two-thirds of the 1,062 responding stations – currently originate local news, while 357 depend on content produced elsewhere. In other words, for every three newscasts in a given night across America, one was not produced by the station broadcasting it. Only three years ago, that ratio was of 1-in-4. Resource-sharing, which if well devised can be a friend, is another symptom of local TV news consolidation. Often, multiple stations will operate out of the one single newsroom and broadcast the exact same stories—sometimes simultaneously. Jacksonville, Florida is a stunning example. According to a recent piece in the Columbia Journalism Review, Jacksonville’s CBS and Fox affiliates are both operated by Cox Media, which also owns WFOX, while the ABC and NBC affiliate stations are both owned by Tegna, Gannett’s television division. Channel 4, the only independent station of the bunch, is the perennial local ratings leader. “Including Channel 4, Jacksonville has five television channels that air just three news broadcasts,” noted the CJR piece. Consumers might also feel the price of consolidation quite literally. Conglomerates like Nexstar, Sinclair and Tegna have considerable leverage over cable providers, with whom they can negotiate higher fees for retransmission. That means the costs can then be passed on to subscribers, as critics of TV news consolidation have argued. But consolidation can also have an upside, providing stations with more resources, allowing them to focus on producing better journalism. It may also be the only chance a smaller newsroom has of surviving, in the opinion of Harry Jessell, an advocate of minimal regulation of the market and editor and co-publisher at TVNewsCheck, a website covering the broadcast industry. Time will tell how much news those stations will continue to produce. 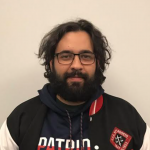 Editor’s Note: Mike Beaudet, a Northeastern professor who heads up the Reinventing Local TV News Project, is an employee of WCVB, a Hearst station.